The Hawaiian Airlines Liberty Challenge attracts top outrigger teams from across the globe, making it the most internationally diverse outrigger race in the world. The event is part of the Hawaiian Airlines World Series of Outrigger Canoe Paddling, which includes the Hawaiian Airlines Molokai Hoe, Hawaiian Airlines Na Wahine O Ke Kai, and Hawaiian Airlines Sydney Harbour Challenge. Many teams compete in several races on this global circuit each year. Winners of the Liberty Men’s Race and Women’s Race win free airfare and entry into the Hawaiian Airlines Molokai Hoe and Hawaiian Airlines Na Wahine O Ke Kai, respectively. The outrigger canoe is descended from the Polynesian seafaring tradition. The canoe was made originally of wood and would seat a varying number of people. A stabilizer (the object that gives the outrigger canoe its name) is lashed to the side of the canoe giving the canoe the added stability needed to navigate through rough ocean conditions. These boats were traditionally used as a primary means of settling and inhabiting the islands of Southeast Asia, Polynesia and the Pacific and would continue to serve as the only means of transportation of people and goods around the Pacific Ocean for thousands of years. This traditional form of transportation has since evolved into a racing and endurance sport in modern times. Races in outrigger canoes seating one person, two people and teams of six people are common in the Pacific Rim and beyond. The sport is no longer limited to the Pacific with outrigger canoes becoming common place near any body of water all over the world. Regardless of the location, the sport continues to emphasize bravery, teamwork and respect for Polynesian traditions. 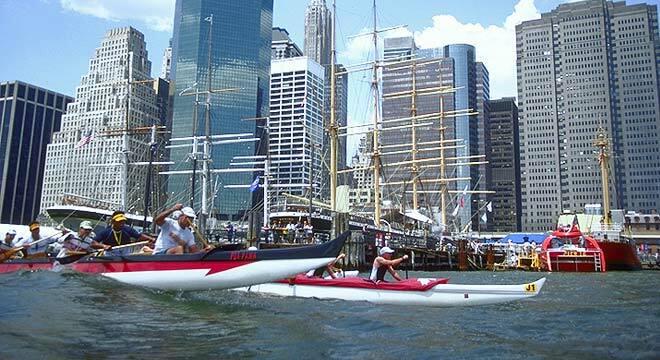 New York Outrigger is proud to introduce this sport to the island of Manhattan, New York City and the Tri-State area.